Ever spent three hours at a single exhibit? Bowie’s on tour like you’ve never seen him beforeÂ – read why ACMI’s just-landed exhibition of the life and times of this rock ‘n roll enigma is a must-see. Fresh from the halls of the CitÃ© de Musique, Paris, the exhibition David Bowie Is officially landed in Melbourne at the Australian Centre for the Moving Image on Thursday 16 July. Arriving early on opening day, I was – forgivably – skeptical of the achievable scope of this exhibition, a showcase and celebration of Bowie’s works. The British-born rocker’s career is mind-blowing on paper alone, with over five decades of music, theatre, art and film under his belt and an estimated 140 million albums sold worldwide.Â Is there more to this experience than just the music and if so – can you fit it all in a single space? The exhibition’s entrance is a fairly run-of-the-mill display of his early yearsÂ and influences, with endearing nods to his adolescent yearsÂ as a effeminate “poser” who rode trains with trendy, complex novels sticking out of his coat pocket. The first real treat is when you round a corner and come head-to-head with his breakthrough performance of Starman on Top of the Pops projected as a wall-high psychedelic mirror image in motion, and get a true sense that you’re witnessing something otherwordly. He is cocky, impish, an alluring, androgynous upstart – and he’s only just getting started. 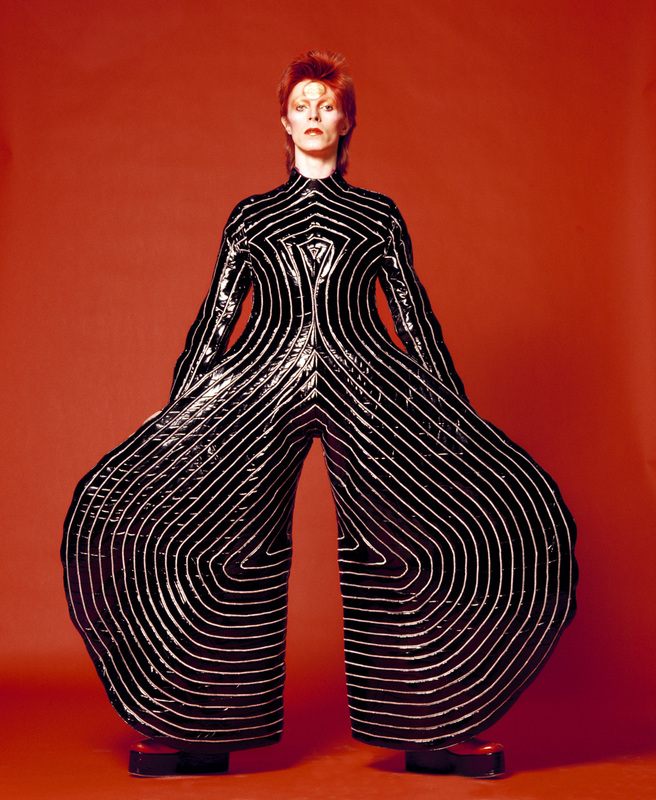 The Aladdin Sane cover outtake (pictured) gracing the exhibition’s promotional material alludes to content that had previously remained archived – and the show doesn’t disappoint. Right from the offset, we’re treated to an intimate arrayÂ ofÂ song lyrics (often with key lines crossed out and rewritten), ticket stubs, early artwork, letters from fans – and one notable telegram from Elvis Presley himself. These painstakingly collated notes, early sketches and album concepts and meanings reveal Bowie’s overarching commitment as an artist and auteur,Â from his fascination with the classic novel 1984 as his inspiration for the albumÂ Diamond Dogs to his constant devotion to turn British pop culture on its head, playing with gender, sexuality and status. 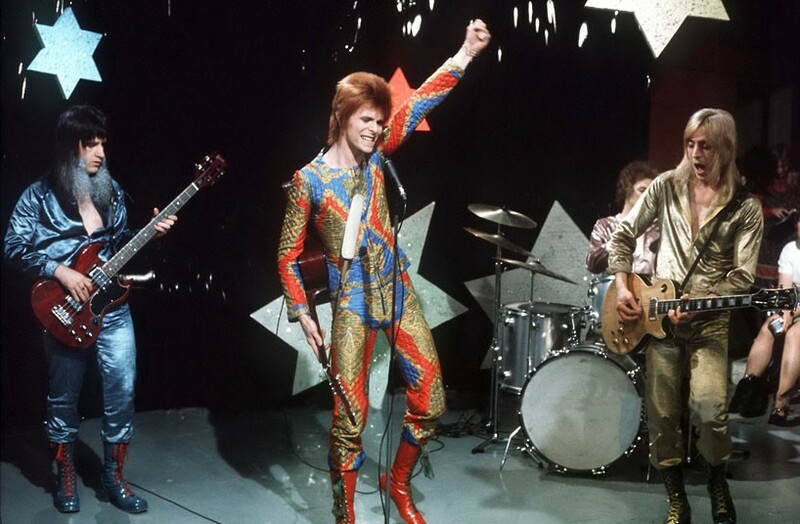 Bowie’s career has always been marked by reinvention, taking on entirely new personas, from the spaced-out Major Tom (1969’sÂ Space Oddity) to the sinister Thin White Duke (1976’sÂ Station to Station) and the 100+ costumes on display pay tribute to each of these, in surprisingly pristine condition. One of the key elements of this otherworldly experience is the success of the audiovisual elements – you’re given headphones at the start of the exhibition, allowing you to listen in on interviews, narration, song snippets and music videos tailored to specific areas of the exhibit. As someone who usually finds headphones intrusive and cumbersome at galleries, this was a credit to The Sennheiser Group, one of the world’s leaders in audio technology. TheÂ experience is often marked by hot breath on your neck or an elbow in the small of your back as people silently drink in all there is to see, but for the most part, the crowds are polite, lost in their own journey, as the headphones provide an entirely immersive experience. Bowie fans are good sorts. To accommodate the ensuing Bowiemania, you must book an entry slot for the exhibition. You’re allowed to stay as long as you like, but pass outs will not be issued. Unlike Bowie in his Thin White Duke years, it would be wise to enter the exhibition fully fed, rested and hydrated, as I stayed for three hours and could have remained longer. Although the man himself has long since retired from public life, though still releasing music every few years, his legacy will live on as one of the greatest musicians the world has known – and well worth the half-day lost in his world that this exhibition provides.